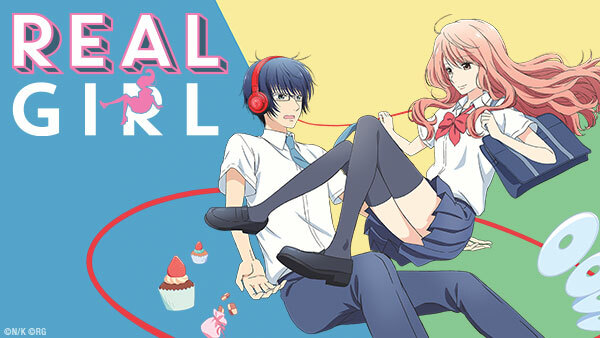 Sign up now to stream Real Girl, subs, tons of dubs, OVA's, simulcasts, plus the all new Dubcast℠ editions and more! Regarding the Courtship of My Female Friend Ishino. E1 | About the Time I First Met Her. Tsutsui and Iroha are forced to clean the pool together as punishment for being late. But is it the start of something more? E2 | About the Time My Chastity was in a Predicament. Tsutsui discovers that real life relationships aren't always easy to navigate as he and Iroha's relationship starts to bloom. E3 | About the Time Normies Made Me Even Worse. Tsutsui struggles with growing feelings he has for his real world girl and receives advice from an unexpected source. Tsutsui receives a mysterious letter to meet someone at the gym. Could this be some kind of confession or will it be a trap? Tsutsui struggles to voice his feelings for Iroha while they deal with the aftermath of the mysterious letter. E6 | About the way I apologize. After an argument with both Itou and Iroha, Tsutsui tries to figure out how to apologize. E7 | About the Two Girls and Me. Iroha and Tsutsui struggle to navigate their feelings and jealousy within their relationship because of the newcomer in their group of friends. E8 | About How Camping Was a High-Level Event for Me. Emotions run high all weekend while the gang is at the cabin, causing conflict around every corner. E9 | About Our Mutual Misunderstandings. Tsutsui and his 3D girl struggle to work through the aftermath of what happened at the cabin. Will this be the end? E10 | About My Confession. Tsutsui finally deals with the awkwardness of Ayado's confession and the aftermath it brings to his relationship. E11 | About the Love of a Best Friend That I Worry About. Despite Tsutsui's honest intentions, he ends up causing more harm than good when he suggests that Ito invite Ayado to see a movie. E12 | About the Shape of Our Love. Tsutsui tries to prove what his relationship with Iroha means after her brother's surprising arrival home. E13 | Regarding the Time We Put One Foot in the Normie World. Nothing can save Tsutsui from the normie event of the season: The Culture Festival. Will the gang be able to pull it together to have an event to remember? E15 | Regarding My Unforseen Family Crisis. Tsutsui welcomes the return of normalcy with sweet relief, but it doesn’t last after he finds his dad at a cafe with a woman who isn’t his mom. E16 | Regarding the Untold Story of My Parents' Courtship. Tsutsui’s family is at a crossroads. Some families can survive betrayals, but others cannot. One thing remains clear though: Trust isn’t so easily repaired once broken. E17 | Regarding Miss Ayado’s New Mental Anguish. When Ayado’s manga-inspired fantasies derail her date with Ito, she realizes dating in 3D is a lot more complicated than it looks. E18 | Regarding the Courtship of My Female Friend Ishino. E19 | Regarding the Troubling Invitation from My Girlfriend. Why has Ito gone to Takanashi for advice? Shouldn’t he be asking Tsutsui for help, instead? They’re best friends, after all, and — wait, Ito asked Takanashi about WHAT? E20 | Regarding When my Friend and my Maybe Friend Became Official. When Takanashi’s mother is hospitalized, Ishino steps in to help cook dinner. She means well, but will Takanashi just see this as more of Ishino’s meddling? As college entrance exams loom large, Tsutsui’s grades begin to slip. Has he stopped caring about his future, or is something else distracting him? E22 | Regarding My Thoughts on the Sacred Mysteries of Life. Iroha’s time with Tsutsui will come to an end in just one month — so why is she avoiding him? E23 | Regarding My Last Promise to Her. Tsutsui has been in a rut ever since he said goodbye to Iroha. Can his friends snap him out of it before their college entrance exams? E24 | Regarding Her Future and Mine. No matter what happens to your memory, they say the heart never forgets.